As I mentioned last week, yesterday was National Chocolate Cake day. Did you celebrate? 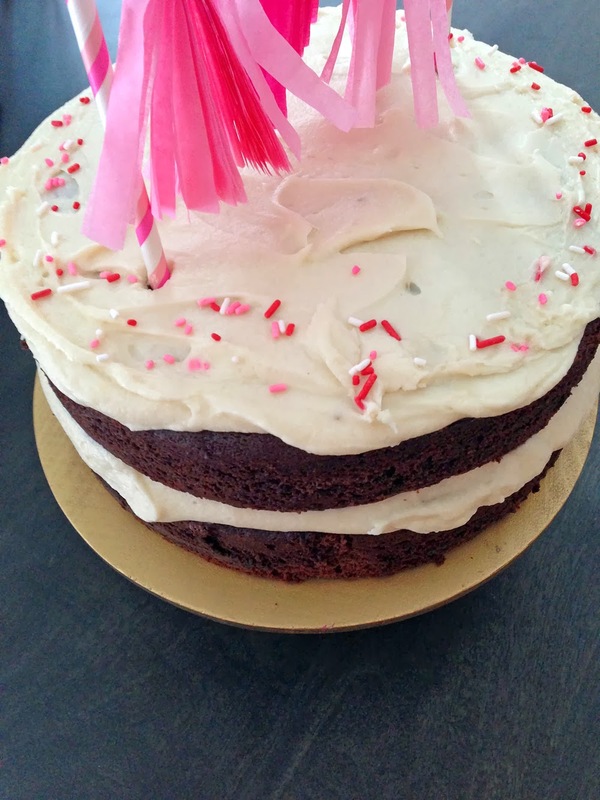 I made a chocolate cake over the weekend with a DIY cake topper in Valentine's colors. (Yes I realize it's not even February yet). I've been noticing that the "naked cake" trend has really taken off, so I thought I'd give it a try. 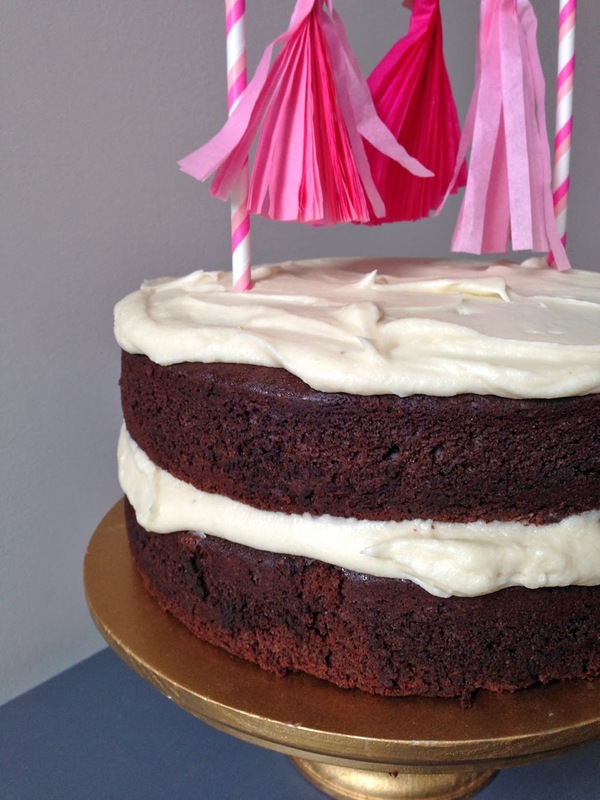 A naked cake is frosted only between the layers and on top, as pictured here. I like the simplicity of the look, plus it saves a lot of time! I did set aside the extra frosting in case anyone wanted more with their slice. 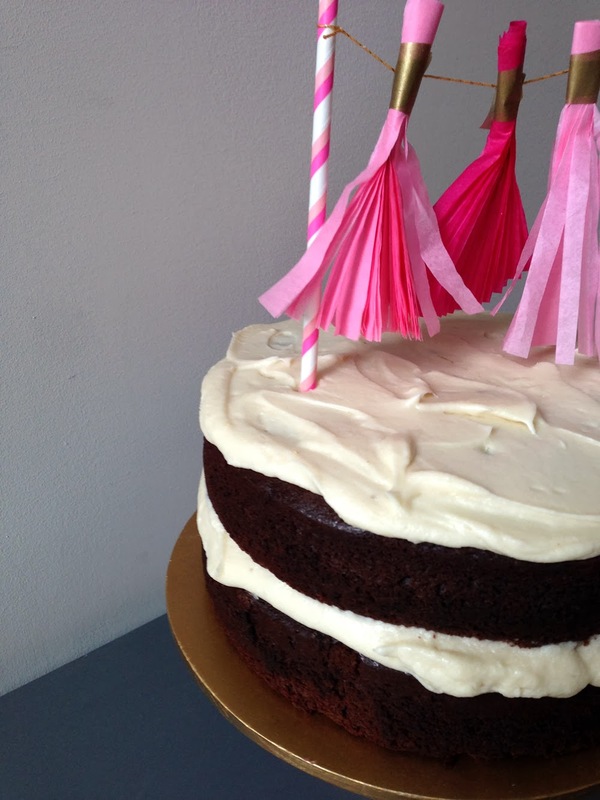 I made the tassel garland cake topper using two "double pink" paper straws from Silver Spoon Scraps and basic tissue paper. 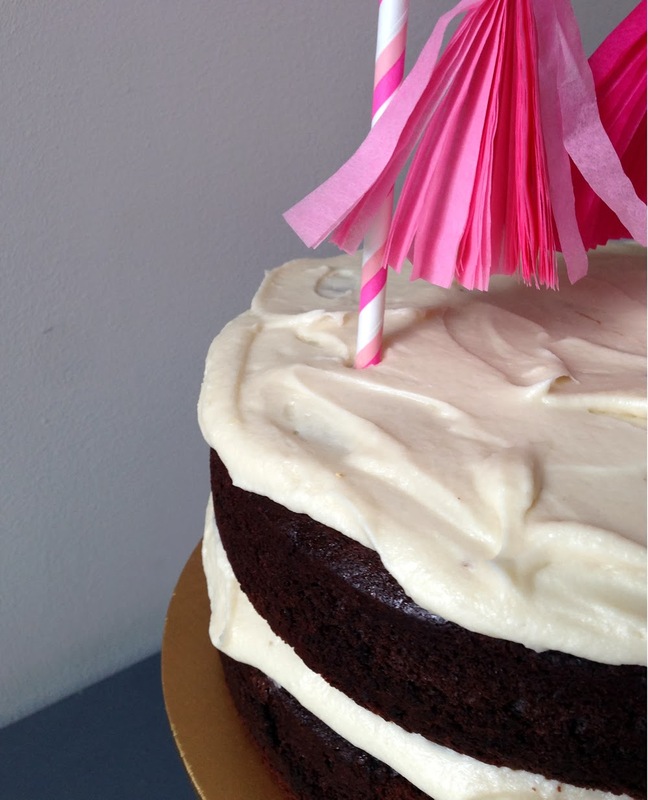 If you're not feeling crafty, you can buy similar cake toppers from several Etsy shops. I like this one from Glam Fete by Bri. For the cake I used this recipe for Bon Appétit's Coffee-Chocolate Layer Cake. The coffee flavor was very subtle - instead of tasting like a mocha cake, it was more of a grown-up, interesting chocolate flavor. I didn't have the time or patience to make a Swiss Meringue buttercream, so instead I made this Basic Vanilla Buttercream by Billy's Bakery via Martha Stewart. Warning: it is VERY sweet. But paired with the rich chocolate the whole cake was nicely balanced. Above, I added some old fashioned Valentine's sprinkles. Did anyone else call sprinkles of this shape "jimmies" in childhood? I served the cake to friends during our Saturday afternoon book club meeting and boxed up an extra slice for each guest in pink bakery boxes. Then I brought what was left (about half) to a friend who had invited me and my husband over for dinner. For those who have asked - this is how I bake so much without eating leftovers all week!